Illuminated, red touch-sensitive buttons are apparently "in" right now, and Maxfield's is joining the party with its Max-Sin Touch, a portable digital audio player that looks suspiciously like M-Cody's M-20. 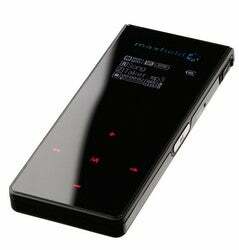 Capable of playing MP3, WMA (DRM'd or not) and Ogg Vorbis files, the Max-Sin Touch is based around 1GB of flash memory. (A 512MB version is also available is you're a penny pincher.) You can transfer music files to it from your Mac or PC over a USB 1.1 or 2.0 connection. We'll have to wait a little while longer for price and release date.